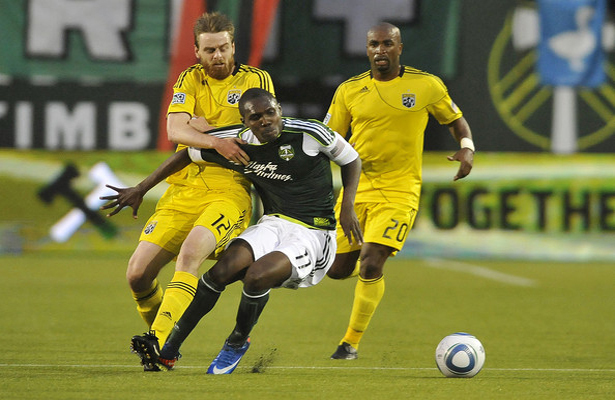 The Portland Timbers are at home against the Columbus Crew next Saturday. Columbus started the season with a 100% record after three games. Since then, they haven’t won a game in the last seven. They are currently on a two game losing streak and haven’t scored a goal in 321 minutes. They haven’t scored a goal from open play in 411 minutes. As a result, they have dropped out of the top half of the Eastern Conference. Columbus are generating a lot of chances. They have the attackers to breakdown the defense, so Ricketts will need to be on form. Federico Higuain runs the Columbus attack from midfield. He’s capable of spectacular goals from outside the box, but with a keeper of Ricketts size, he’s unlikely to try anything too audacious. Jairo Arrieta is the hit man up top, with Speedster Dominic Oduro looking to beat defenders on the break. Justin Meram has been coming off the bench without any great effect. Despite all this talent, the ball isn’t finding the back of the net. It might be a lot of bad luck, but something isn’t right up front for the Crew. Bernardo Anor is a lively young midfielder for the crew. The Venezuelan has two goals so far this season, but more importantly 22 shots. He is capable of getting into good shooting positions and makes the third man follow up run into the box when he doesn’t have possession. Hector Jimenez, Wil Trapp and Cameroon national, Tony Tchani make up the rest of a very settled midfield. Columbus has a relatively stout defense (conceding an average of one goal a game). However, three Columbus Crew defensive players have been placed on preliminary World Cup duty. All three have started every game for Columbus this year. Club captain Michael Parkhurst, Giancarlo Gonzalez and Waylon Francis are all part of that relatively solid back line. It will be difficult for Columbus to replace all three. So the Timbers will have the chance to take advantage of the disrupted back line. During the offseason, Columbus traded goal keeper Andy Gruenebaum to eastern conference rival, Kansas City. A perplexing move at the time, until they aquired Steve Clark from Seattle. The Michigan native has been in fantastic form. And he’ll need to be again on Saturday if Columbus are to get anything out of their trip to Portland. In other Columbus news, Eddie Gaven retired at the end of last season after a career ending injury that he suffered in a US Open Cup match. After failing to recover from the ACL injury, the 27 year old (11 season MLS verteran) decided to hang up his boots. Also in the offseason, the Crew announced an affiliate partnership with Dayton Dutch Lions FC of USL PRO, and immediately sent five to Dayton on loan.